Rotherham United sealed their Championship status for another season as Wolves were held to a fourth successive goalless draw at home. Dave Edwards shot wastefully wide for Wolves early on after getting on the end of a cut-back pass from Joe Mason. Danny Batth had a header tipped onto the bar by Millers keeper Lee Camp, who rushed out to deny Mason in what was the hosts' best chance after the break. 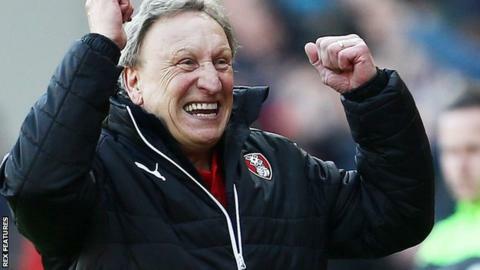 Neil Warnock's Millers held on to extend their unbeaten run to 11 games. Rotherham have lost just twice in 14 games since the much-travelled Warnock took charge in February, when the Millers were three points adrift of safety. Even without their away point, Rotherham would have been safe as MK Dons were relegated to League One following a 4-1 home defeat by Brentford. Wolves remain 14th in the table, having now gone goalless at Molineux since Matt Doherty's injury-time winner beat Bristol City 2-1 on 8 March. "Ultimately there is some frustration because we have drawn four games on the trot at home 0-0 and it is not a record we want. But it's better than losing games. "We played some good football, particularly through James Henry, who was our best player and had lots of freedom. "We had clear-cut chances but ultimately you need to put those chances away and we didn't. "We have to keep looking to find the right mix and the winning equation, which is what we are looking for." "It will take a while to realise what an achievement that is. "The players have been fantastic and the chairman has been unbelievable and it's wonderful for me to give them something to smile about because they have worked ever so hard to get Rotherham in the Championship. "I am speaking to the chairman in the next couple of weeks. I said once we're safe we'll have a chat, I will be in the Championship next year, I am speaking to him so we will just have to see how it develops. "It's great to come here and get it put to bed. If you'd have told me that at the start I'd have snapped your hands off. Now I want to finish as high as I can." Match ends, Wolverhampton Wanderers 0, Rotherham United 0. Second Half ends, Wolverhampton Wanderers 0, Rotherham United 0. Attempt missed. Sylvain Deslandes (Wolverhampton Wanderers) header from the centre of the box is close, but misses to the left. Assisted by James Henry with a cross following a corner. Corner, Wolverhampton Wanderers. Conceded by Frazer Richardson. Foul by Jed Wallace (Wolverhampton Wanderers). Greg Halford (Rotherham United) wins a free kick in the defensive half. Corner, Wolverhampton Wanderers. Conceded by Lee Camp. Attempt saved. Joe Mason (Wolverhampton Wanderers) header from the centre of the box is saved in the top centre of the goal. Assisted by Matt Doherty with a cross. Greg Halford (Rotherham United) is shown the yellow card. Attempt saved. Matt Derbyshire (Rotherham United) right footed shot from outside the box is saved in the centre of the goal. Assisted by Leon Best. Attempt saved. Matt Derbyshire (Rotherham United) left footed shot from the centre of the box is saved in the bottom right corner. Assisted by Kirk Broadfoot. Attempt blocked. Matt Derbyshire (Rotherham United) right footed shot from the left side of the box is blocked. Assisted by Richard Smallwood. Attempt missed. Matt Doherty (Wolverhampton Wanderers) right footed shot from outside the box is high and wide to the right. Assisted by Jed Wallace. Kirk Broadfoot (Rotherham United) is shown the yellow card. Kirk Broadfoot (Rotherham United) has gone down, but that's a dive. Foul by Sylvain Deslandes (Wolverhampton Wanderers). Attempt blocked. Grant Ward (Rotherham United) left footed shot from the right side of the box is blocked. Assisted by Richard Smallwood. Lee Frecklington (Rotherham United) wins a free kick in the attacking half. Substitution, Rotherham United. Frazer Richardson replaces Joe Mattock. Attempt blocked. Jed Wallace (Wolverhampton Wanderers) left footed shot from the centre of the box is blocked. Assisted by Dave Edwards. Attempt blocked. George Saville (Wolverhampton Wanderers) right footed shot from the centre of the box is blocked. Assisted by Joe Mason with a cross. Corner, Wolverhampton Wanderers. Conceded by Joe Mattock. Attempt saved. Lee Frecklington (Rotherham United) right footed shot from outside the box is saved in the centre of the goal. Assisted by Leon Best. Substitution, Wolverhampton Wanderers. Jed Wallace replaces Bright Enobakhare. Attempt missed. James Henry (Wolverhampton Wanderers) right footed shot from outside the box is too high. Assisted by Dominic Iorfa. Attempt saved. Joe Mason (Wolverhampton Wanderers) left footed shot from the centre of the box is saved in the centre of the goal. Assisted by James Henry with a through ball. Attempt saved. Matt Derbyshire (Rotherham United) right footed shot from the centre of the box is saved in the top centre of the goal. Assisted by Greg Halford. Attempt missed. Sylvain Deslandes (Wolverhampton Wanderers) left footed shot from very close range is close, but misses to the left. Assisted by Joe Mason with a headed pass. Foul by Bright Enobakhare (Wolverhampton Wanderers). Joe Mattock (Rotherham United) wins a free kick in the attacking half. Attempt saved. Joe Mason (Wolverhampton Wanderers) left footed shot from the centre of the box is saved in the centre of the goal. Assisted by James Henry with a headed pass.